Obviously, the directory sometimes counted the honbu dōjō only, without giving any and all double and multiple affiliations, and without giving all shibu (branch)-dōjō. For example, Shiroma Katsuo was correctly counted among Matsubayashi-ryū, however, does not separately appear under Ryūkyū Kobudō Hozon Shinkōkai, of which he was a member at the time. According to this, the actual total number of affiliated dōjō was considerably larger. Same goes for the national overseas shibu: the directory often only included national overseas honbu (headquarter) dōjō, with the national shibu linked to Okinawa only via this national honbu and without counting it individually. In addition, although there is often only one representative honbu dōjō in an overseas country, sometimes other dōjo might also be affiliated to Okinawa independently. Finally, not only affiliations might change immensely over time, but also the organization in Okinawa itself. Remember that I analyzed the directory 10 years ago. Since that time, many things have changed. Same is true for 1995, 1985, 1975, and so on. It’s a living thing. It’s not about what is not known and not included, but what is known and is included. 1. 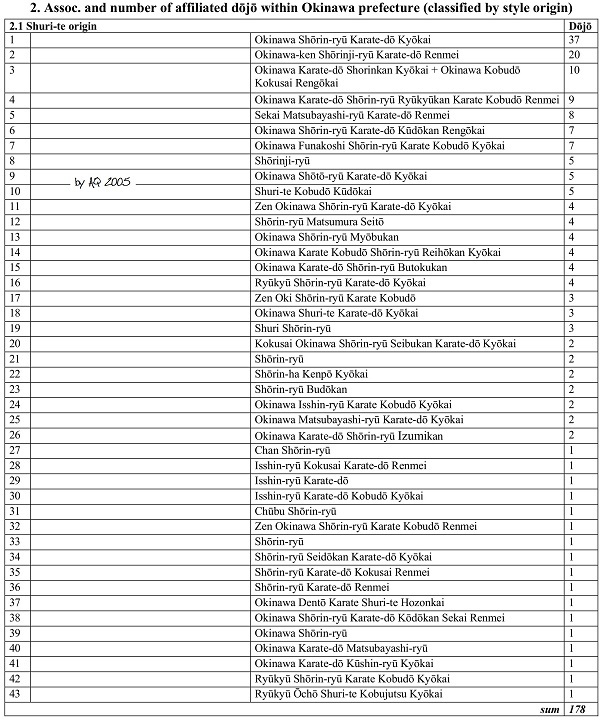 Number of ryu, kai, ha and their dojo within Okinawa Prefecture. 2.1. 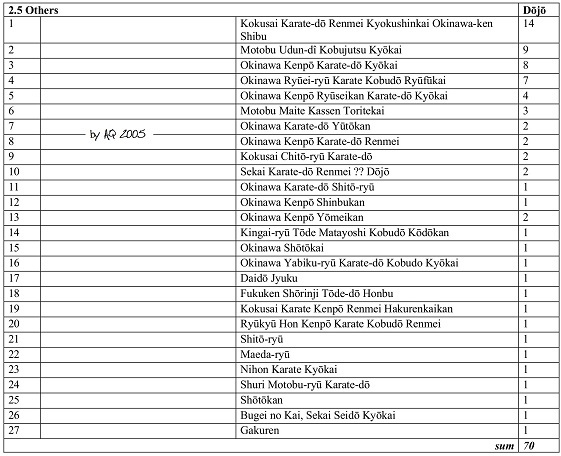 Associations and number of affiliated dojo within Okinawa Prefecture – Shuri-te origin. 2.2. 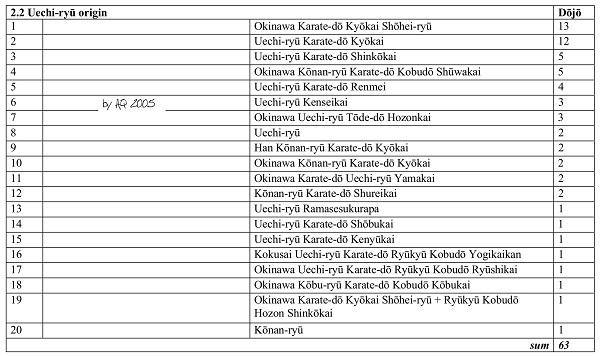 Associations and number of affiliated dojo within Okinawa Prefecture – Uechi-ryu origin. 2.3. 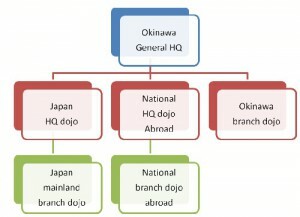 Associations and number of affiliated dojo within Okinawa Prefecture – Naha-te origin. 2.4. 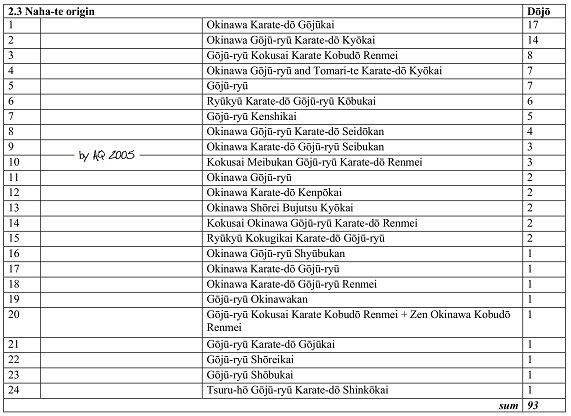 Associations and number of affiliated dojo within Okinawa Prefecture – Kobudo origin. 2.5. 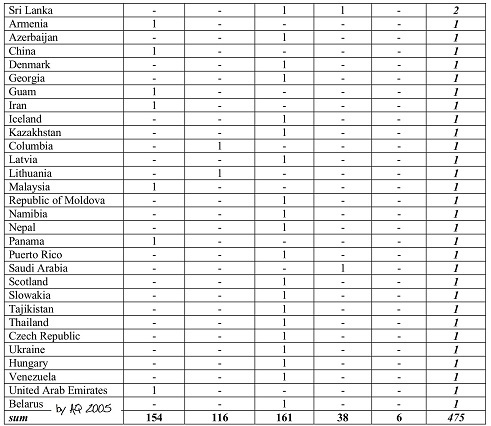 Associations and number of affiliated dojo within Okinawa Prefecture – Others. 3. 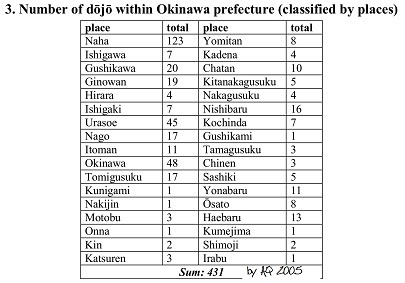 Number of dojo within Okinawa Prefecture – classified by places. 4. Number of dojo outside Okinawa Prefecture – mainland Japan. 5.1. 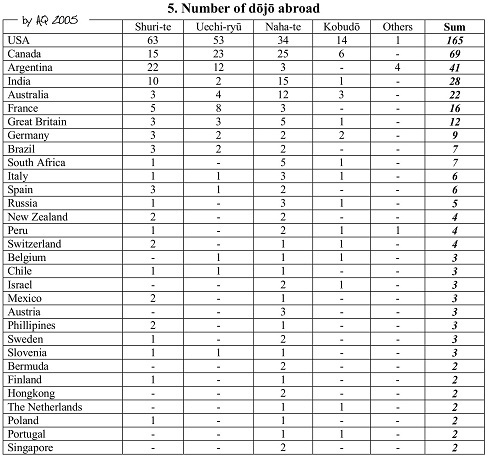 Number of dojo outside Okinawa Prefecture – Overseas. 5.2. Number of dojo outside Okinawa Prefecture – Overseas. This entry was posted in Unknown Ryukyu and tagged Dojo List, Karate, Kobudo, Okinawa. Bookmark the permalink.